Micropore particle technology (MPPT) consists of fine particles full of narrow pores. Transport it away from the wound surface by capillary action. Effectively evaporate the exudate due to an increased surface area. Removal of excess water as well as proteases, pro-inflammatory factors, and other factors in the exudate that can interfere with the wound healing process. Removal of bacterial and fungal toxins and enzymes (their weapons) and disruption of biofilm (their protective armour). This returns control of the wound and the wound environment to the immune system. This provides a quicker and more efficient way to remove wound infections. MPPT effectively absorbs and transports water to its surface. Studies show that nothing is released from the particles onto the wound surface. MPPT has been shown not to be antimicrobial. 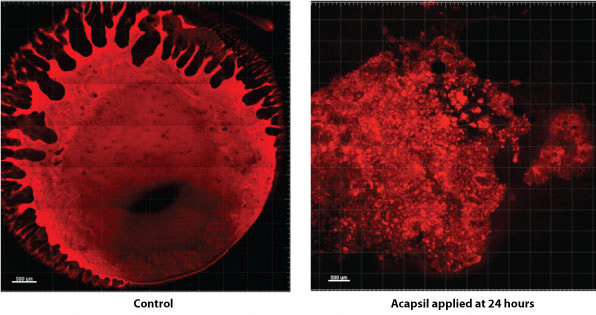 MPPT disrupts the surface of biofilm (see below), but without affecting the ability of bacteria to secrete biofilm. Canesso et al. (2014) compared the distribution of immune cells over time in a wound in germ-free mice, i.e. mice that have been born and raised in a sterile environment, to normal mice. The immune response in normal rats (Bilyayeva et al. 2014) that had received MPPT application onto a wound was very similar to that seen in the germ-free mice. This indicates that MPPT removes the negative effects of microbes on the immune response. Our understanding of the microbiome is currently too incomplete to be able to use data on changes in the individual strains of microbes constituting the microbiome to draw conclusions. In contrast, we much better understand the roles different types of immune cells play in healing. The preclinical study (Bilyayeva et al. 2014) showed that the colonisation of the wound by microbes in the MPPT group was similar to the untreated control group, whereas it was inhibited in the group receiving topical antibiotic. This indicates that MPPT does not affect the microbiome negatively, which is consistent with its lack of antimicrobial action. In a preclinical wound healing model, MPPT was compared to a topical antibiotic (gentamicin) and to untreated controls; and in a randomised clinical study, MPPT was compared to the same topical antibiotic (gentamicin) and to a topical antiseptic (iodine). In both studies, wounds receiving MPPT were cleared of infection and necrosis 60% quicker than the topical antibiotic. In the preclinical study, the wounds closed 26% quicker in the MPPT group; and in the clinical study patients in the MPPT group had 31% fewer hospitalisation-days compared to the topical antibiotic. The preclinical study showed that the group receiving MPPT were significantly less affected by their wound, i.e. their growth rate was closer to normal than the other groups. MPPT has in a number of cases been able to remove wound infections and advance the healing of non-healing wounds, i.e. wounds that had not responded to a wide range of existing approaches. Effects of MPPT application at 24 hours on Pseudomonas aeruginosa biofilm. The biofilm cultures were photographed and analysed when they were 48 hours old. cytotoxic, i.e. has toxic effects on the body’s own cells. act by balancing the microbiome, i.e. returning control of the wound to the immune system. days required to remove wound infection and promote healing in patients. Comparison of antibiotics, antiseptics and MPPT. *Data from Bilyayeva et al. (2017). The number of days to reach a non-infected wound, i.e. free of necrosis, pus and fibrinogenous thickenings, were recorded for MPPT (n=88), a topical antibiotic (gentamicin) (n=90) and an antiseptic (iodine combined with DMSO) (n=88). Antibiotics remove wound infections and start the healing significantly quicker than antiseptics. This correlates well with the finding that antiseptics are toxic to the body. MPPT, which does not kill cells but instead balances the microbiome, removes infection and starts the healing 60% quicker than antibiotics and antiseptics. Bacteria and fungi use “weaponry” against other microbes and against the immune system to gain or maintain control of a specific area. Weapons - toxins and enzymes that are released to kill or inhibit the function of other microbes and immune cells. Protective armour – biofilm, which is secreted as a shield or fortress that cannot be penetrated by immune cells (or by antibiotics). By removing the damaging toxins and enzymes, the immune cells regain their strength and abilities. By disrupting the shielding biofilm, the immune cells can enter the fortress and remove unwanted microbes. Do NOT rely on antibiotics, which mean that MPPT will not be limited by antibiotic resistance issues and will not contribute to the generation of new resistant strains. Do NOT rely on chemical action to kill cells, which means that MPPT - unlike antiseptics and Manuka honey - is not poisonous to human and animal cells and will not impede cell growth and regeneration. These kill bacteria and fungi by interfering with their functions pharmacologically, e.g. disrupting cell wall synthesis. Their effect is indiscriminate, i.e. all or most classes of bacteria and fungi are killed, but it is selective, because they do not affect the body’s own cells. they have difficulty penetrating biofilm. some individuals become sensitive to certain drug classes, e.g. penicillin. prolonged use can cause side-effects, e.g. kidney damage. These include e.g. PHMB, iodine, silver and chlorhexidine, and they kill bacteria and fungi by chemical action. This means that they will affect the body’s own cells at the same or close to the same concentration at which they kill the microbes, i.e. they lack the specificity of antibiotics and antifungals. kill human and animal cells in cultures. Inhibit formation of new tissue in animal models of wound healing. Most types of honey obtain their antimicrobial effects by the generation of hydrogen peroxide. Exists naturally in the body, which means that the enzymes to degrade it will be available. High levels for longer periods will be toxic. It will damage the microbiome. Manuka Honey originate from New Zealand and it obtains its antimicrobial effects from the chemical methylglyoxal, which originates from the flowers the bees visit. Toxic to cells involved in wound healing. A potent neurotoxin, i.e. it kills nerve cells. Accumulating in tissues and causing damage. Canesso MC, Vieira AT, Castro TB, Schirmer BG, Cisalpino D, Martins FS, Rachid MA, Nicoli JR, Teixeira MM, Barcelos LS (2014) Skin wound healing is accelerated and scarless in the absence of commensal microbiota. J Immunol. 193(10):5171-80.